Malcolm Suber is a professor at Southern University at New Orleans. In the late 1970s, Malcolm Suber was a leader of the pro-China Communist Party USA (Marxist-Leninist), but was expelled circa early 1980 with Albert Thrasher of Birmingham as part of a ’left’ liquidationist faction. That in turn "engineered a split in the Party, moving to build a Maoist, ultra-left nationalist party, based mainly in the South, abandoning the majority of the industrial proletariat." Suber later became close to the pro North Korea/Russia/Iran Workers World Party. 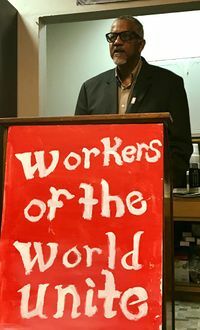 On Oct. 22 2005 in New York, the Workers World newspaper staff hosted a forum called "Katrina: A Challenge for the Movement: Forging a united front between the Black liberation, workers' and anti-imperialist struggles." Malcolm Suber, a founder and leader of the People’s Hurricane Relief Fund in New Orleans, announced his candidacy for an at-large seat on the New Orleans City Council on Sept. 6 2007. Suber has been in the forefront of exposing the racist criminal neglect by local, state and federal governmental officials shown toward the majority Black population during and after Hurricane Katrina in 2005. Suber is a Katrina survivor. Suber’s campaign supporters included former Georgia U.S. Rep. Cynthia McKinney and Hip Hop artist and actor Mos Def. Suber failed to win the seat. In 2017, Malcolm Suber and Angela Kinlaw joined forces to create the People’s Assembly New Orleans. Malcolm Suber, and Workers World Party member Gavrielle Gemma lead Take ‘em Down NOLA which has has led the push to dismantle historic Confederate monuments in New Orleans. We are fighting now for a resolution to remove all the white supremacy monuments and street names and public buildings named for the slavemasters. This is a struggle that will continue until we finish the main course. A written written statement included a list of Take ‘em Down NOLA’s targets for removal or renaming. The list includes at least a dozen monuments, 24 streets, seven school campuses and two hospitals. In October 2017, Gavrielle Gemma and Malcolm Suber celebrated the 100th Anniversary of the Bolshevik Revolution at an event in New Orleans.